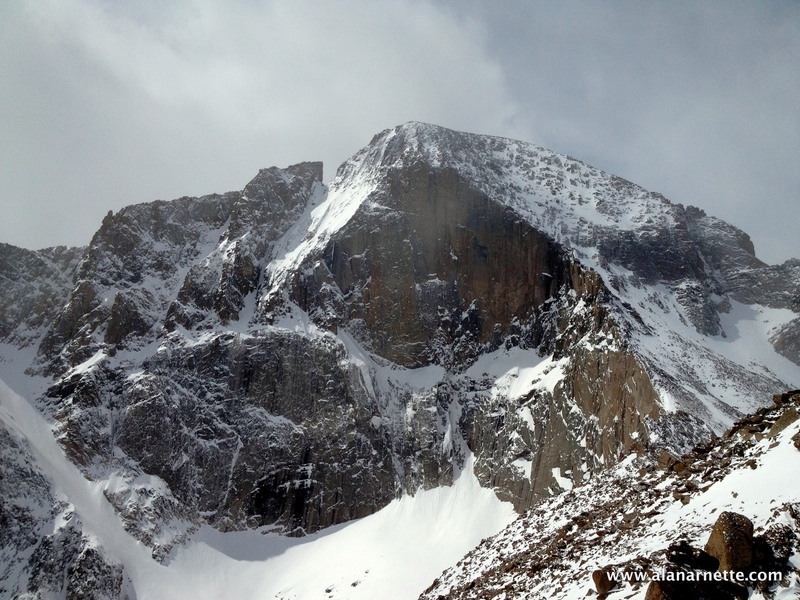 Over the weekend the popular Colorado 14, 000 foot mountain, Longs Peak, saw the first death of 2016. 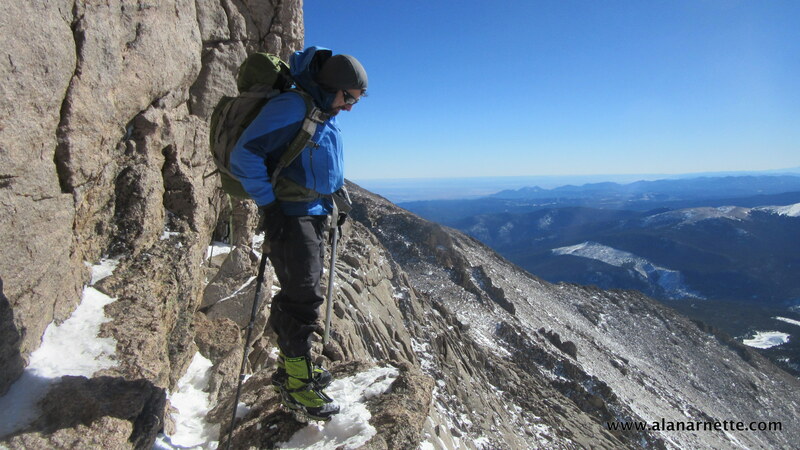 The rangers were flown to the summit of Longs Peak via helicopter and reached the man’s body at approximately 4 p.m. His body was recovered by a long line helicopter operation at 5:40 p.m. and transferred to the Boulder County Coroner’s Office. His name has not been released. Longs is one of the most popular Colorado 14ers with over 15,000 attempts each year and a 50% success rate. It is consider attainable by the normal Keyhole route, but the Park Service provides stern warnings about underestimating the route. In addition to the attainable routes of the Keyhole and Loft, Longs offers over a hundred of more difficult climbs including some of the big wall climbing in the world on the Diamond. The section where this fatality occurred is a relatively short section of maybe 1,000 feet (300 meters) but as the name implies it starts very narrow, perhaps 3 feet (1 meter) in width. To the climber’s left is a 300′ vertical rock wall and to the right a 200′ drop onto rock. This section can accumulate snow and ice throughout the year, including summer, so it is advisable to always carry microspikes at a minimum and to turn back if you are not prepared (or experienced) or the route is extremely icy. On June 6, 2013 I summited Longs for the 30th time. I climbed up via the Keyhole route and descended using the Loft route. 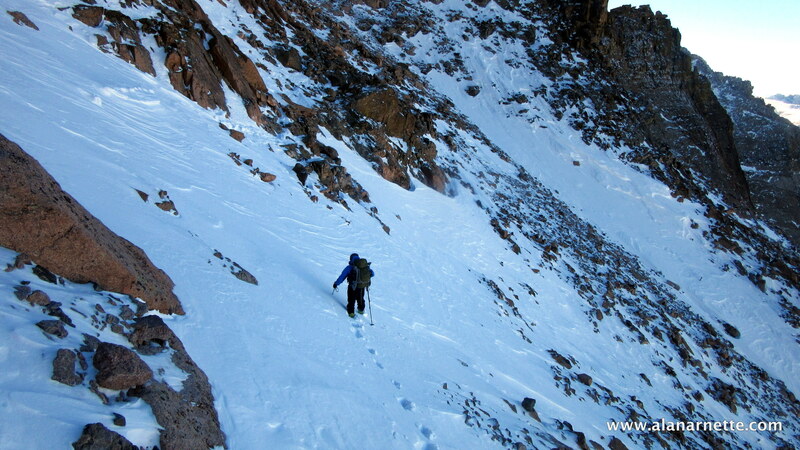 It was spring weather with winter climbing conditions above 12,000′. This 12 minute video takes you through the climb from start to finish: 10 hours, 5500′ gain, 14 miles roundtrip. My condolences to the climbers family and friends of the deceased this weekend.